Today's historic Venus transit is a marathon event lasting nearly seven hours, but skywatchers who don't have that kind of time can break it down into a handful of key milestones. Venus treks across the sun's face from Earth's perspective today (June 5; June 6 in much of the Eastern Hemisphere), marking the last such Venus transit until 2117. Few people alive today will be around to see the next transit, which makes the rare celestial sight a premier event in the astronomical and skywatching communities. Before you even attempt to observe the transit of Venus, a warning: NEVER stare at the sun through binoculars or small telescopes or with the unaided eye without the proper safety equipment. Doing so can result in serious and permanent eye damage, including blindness. With that warning stated, here's a look at the first major stage of the transit of Venus. 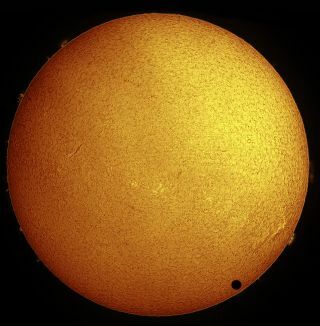 The transit officially commences when the leading edge of Venus first touches the solar disk, an event astronomers call "Contact I" or "ingress exterior." This milestone occurs at 6:03 p.m. EDT (2203 GMT) for observers in eastern North America, while skywatchers on the other side of the continent will see it a few minutes later, at 3:06 p.m. PDT. If you're viewing the transit through a good telescope, you may see a dark teardrop form, briefly joining Venus' trailing edge and the solar disk just before Contact II. This so-called "black-drop effect" bedeviled efforts in 1761 and 1769 to measure the Earth-sun distance by precisely timing Venus transits from many spots around the globe. Scientists once thought the black-drop effect was caused primarily by Venus' thick atmosphere, or by viewing through Earth's ample air. But astronomers also observed it in images of a Mercury transit snapped by a NASA spacecraft in 1999. Mercury has an extremely tenuous atmosphere, so the prevailing wisdom had to go. "Our analysis showed that two effects could fully explain the black drop as seen from space: the inherent blurriness of the image caused by the finite size of the telescope, and an extreme dimming of the sun’s surface just inside its apparent outer edge," Jay Pasachoff of Williams College, who helped analyze the 1999 Mercury transit pictures, wrote last month in the journal Nature. After Contact II, Venus continues its long, slow and slanting trek across the sun's face. The next major milestone comes at roughly 6:25 p.m. PDT (0125 GMT on Wednesday; switching to Pacific time now, as the sun will have set in eastern North America), when Venus reaches the exact center of its transit path — a point known as "Greatest Transit." Earth's so-called sister planet will keep traveling across the solar disk for another three hours or so. The beginning of the end for the transit comes at about 9:30 p.m. PDT (0430 GMT Wednesday) with "Contact III," when Venus' leading edge touches the boundary of the solar disk. Contact III, also known as "egress interior," represents the last moment when Venus is still entirely contained on the sun's face, and it offers another chance to witness the black-drop effect. The last-in-a-lifetime show ends 18 minutes later with "Contact IV," or "egress exterior," when Venus finally moves off the solar disk. As the times of these various events indicate, much of the world won't be able to observe the whole transit. In most of North America, for example, the sun will set before the celestial festivities end, while much of Europe will witness only the last stages of the transit as the sun is coming up. Large portions of South America and Africa will miss out entirely. However, some regions of the globe will be treated to the entire spectacle. These include eastern Asia, eastern Australia, New Zealand and the western Pacific, as well as Alaska, northern Canada and almost all of Greenland. To safely observe the Venus transit, you can buy special solar filters to fit over your equipment, or No. 14 welder's glass to wear over your eyes, as outlined above. The safest and simplest technique, however, is probably to observe the transit indirectly using the solar projection method. Use your telescope or one side of your binoculars to project a magnified image of the sun’s disk onto a shaded white piece of cardboard. And if weather or sunrise/sunset times conspire against you, you can always watch the Venus transit online. Multiple organizations will be broadcasting live footage of the event from a variety of locations around the world, some of which are bound to have clear skies.